An impacted tooth is one that fails to erupt into the dental arch within the expected developmental window. Because impacted teeth do not erupt, they are retained throughout the individual’s lifetime unless extracted or exposed surgically. Teeth may become impacted because of adjacent teeth, dense overlying bone, excessive soft tissue or a genetic abnormality. Most often, the cause of impaction is inadequate arch length and space in which to erupt. That is the total length of the alveolar arch is smaller than the tooth arch (the combined mesiodistal width of each tooth). 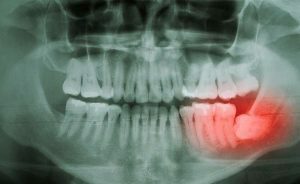 The wisdom teeth (third molars) are frequently impacted because they are the last teeth to erupt in the oral cavity. Mandibular third molars are more commonly impacted than their maxillary counterparts. As a general rule, all impacted teeth must be removed, except canine teeth; canines do not need surgery and may just remain buried and give no further problems. Crowns are tooth-shaped caps that fit over a natural tooth for aesthetic or structural reasons. A crown may be recommended when a tooth is cracked, broken, or misshapen. A crown can also be used to complete dental procedures, such as bridges, root canals, and dental implants. Crowns must be able to firmly affix to an existing tooth. Crown lengthening can help. Dental surgeons perform crown lengthening by recontouring gum tissue, and sometimes bone, to expose more of a tooth’s surface for a crown. It’s a common procedure and often takes less than an hour to complete. Although dark gums may be healthy, some patients find them unattractive and seek measures to lighten them. 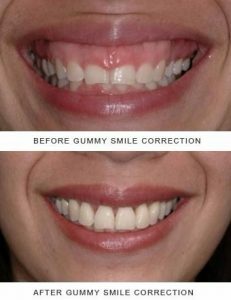 This procedure goes under several names including dark gum treatment, gum bleaching, gum depigmentation and other variations on the name. The gum bleaching treatment is considered aesthetic because the patients who have the dark gums treatment elect to have the procedure done to improve the appearance of their smiles.